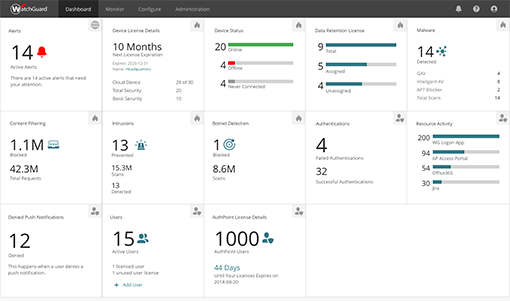 WatchGuard Cloud allows you to manage and report on your security from just one powerful platform. Whether you want to reduce or eliminate infrastructure costs, accelerate your set-up, deploy remote sites at any scale, simplify your security management tools, or gain greater visibility into your network, WatchGuard Cloud can help. No need to jump from tool to tool to manage your security or inventory. 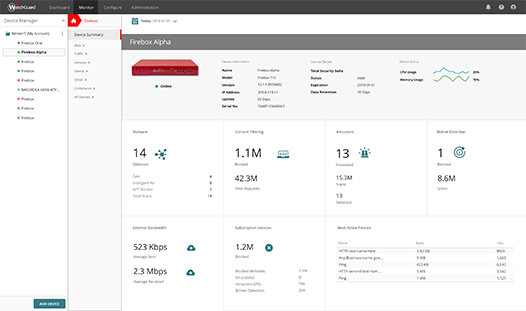 With WatchGuard Cloud, you can deploy Firebox appliances in minutes, allocate AuthPoint licenses, and monitor your network all from one, centralized location. The days of sizing, upgrading, and maintaining infrastructure are gone. With WatchGuard Cloud, there’s no infrastructure to deploy or maintain. Lower your total cost of ownership (TCO) with flexible data retention options and with set-up that only takes a few minutes. 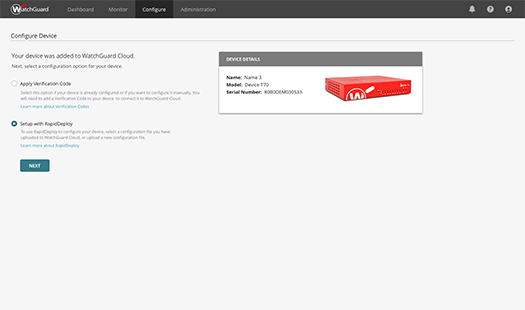 RapidDeploy is a powerful, Cloud-based deployment and configuration tool that comes standard with WatchGuard Firebox appliances. It’s fully built into WatchGuard Cloud, enabling you to get your Fireboxes up and running in minutes. Simply upload a configuration, then all new Fireboxes will call home and start securing your business. There is minimal user intervention required, and it can be done from anywhere, at any time. It’s that easy. Managing AuthPoint, WatchGuard’s innovative multi-factor authentication solution, is simple, intuitive, and centralized through WatchGuard Cloud. The management user interface allows you to view AuthPoint reports and alerts, configure services, and manage tokens all from one location. Getting started is easy with automated token provisioning and de-provisioning, full synchronization with existing user repositories (e.g. Microsoft Active Directory and LDAP), and support for dozens of 3rd party integrations. 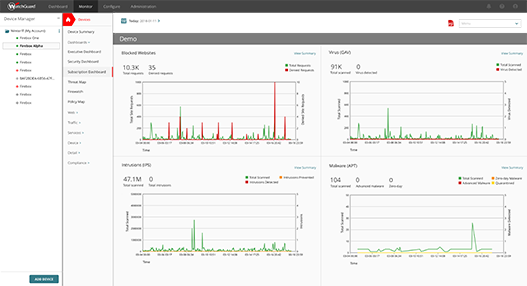 Understand what’s happening in your network with WatchGuard Cloud Visibility. With 100+ dashboards and reports, you can quickly see high-level trends and anomalies, then drill down into detailed information on each for a deeper understanding. The information is actionable and insightful so that you can use it to make informed decisions that keep your network secure.